WordFly will automatically suppress your unsubscribe and hard bounce addresses from emails you have sent out from WordFly. 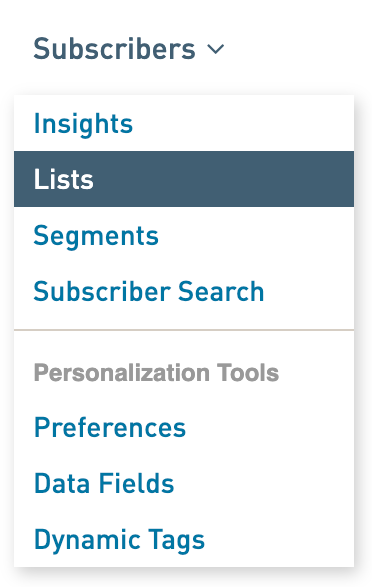 The suppression happens when new lists are imported fresh into WordFly. Let's review the process and how to make sure you are not emailing unsubscribes and hard bounces again. When you start using WordFly for the first time you might want to make sure your unsubscribes and hard bounces from a previous email service provider are logged in your WordFly account. This way WordFly will make sure those subscribers who have opted out remain so as you start sending emails from WordFly. All addresses on the list will be flagged as unsubscribes. WordFly will suppress these addresses on new list imports. Previous list imports will not have a record of the unsubscribe. If you need another list unsubscribed we'll need to do the same thing. Adding subscribers to this list will not unsubscribe the address. The date of the unsubscribe is actually logged one month in the past from the day we flag the subscribers. This is done so that you will not be billed for these subscribers. 1. Obtain a CSV file export of all your unsubscribe and hard bounce addresses. 4. Follow the steps in this post to import your CSV list: How do I import a list from a file? Tip: Be sure to name your list something like 'Unsubscribes from previous ESP' or 'Unsubscribes and Hard bounces'. 5. Email support@wordfly.com to let us know you have imported your CSV file, provide the name of the file, and let us know you want us to mark these addresses as 'unsubscribes'. We will confirm we have received your request and will let you know when we have completed that step. It usually only takes a couple minutes! The unsubscribe and hard bounce filtering is working constantly in all WordFly accounts to ensure subscribers with opt-outs or bad addresses are not emailed again. Let's review how this process works on new list imports and sent to lists. Learn more: Where can you see subscriber import issues in WordFly? WordFly suppresses all unsubscribes and hard bounces in your list when you import your lists. If you do not re-import your list, WordFly will not globally suppress new unsubscribes and hard bounces that have come in since the previous emails in your account were deployed. WordFly does suppress these on the list unsubscribed from but not in other existing lists. It's generally a good rule to try to import lists new with each Campaign deployment. This works well with the concept of Email Campaigns in WordFly. We consider an Email Campaign a means for sending out 1 email template with 1 subscriber list. The email template and subscriber list would naturally be unique each time. When you import and send to a list the unsubscribes and hard bounces that come in from that sent list will update behind the scenes on that list but not be reflected in the list summary. 3. 24 hours pass and WordFly updates the counts on the list. Let's look at one example. You are emailing your Newsletter list today and next week you want to email the same list again. You will import your Newsletter list today, send your Email Campaign with this list. Email responses will come back, including some unsubscribes and hard bounces. Next week you will select to send to the same list again. Unsubscribes from last week will not be reflected on the list summary; however, when you send to the list the unsubscribed addresses will be suppressed when the email is sent. How can I see manage and export subscribers who weren't imported?